A couple of days ago I argued that the Liberals and the Conservatives and, for that matter, the NDP did not deserve your vote in this year's federal election. In the piece, entitled, "This Year, This Vote, Is Different. It Matters Like It Never Mattered Before," I said this time common decency demands that we reject these parties and vote, instead, for the future, for our 7 million young people and those who will follow them who will never have a say in their future, not in time. My point was that if we even take 5 per cent or 10 per cent of the vote it will be enough to force Trudeau or Scheer or Singh to give up on the petro-state and start doing what these younger generations so badly need. 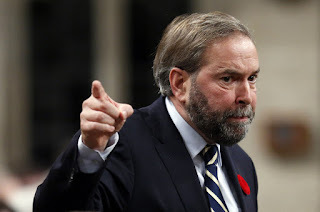 Former NDP leader Thomas Mulcair was not being malicious when he suggested the Green party might be becoming a refuge for orphan progressive voters in the lead-up to next fall’s federal election. ...If Singh does secure a seat in Parliament later this month, it will take more than a good performance in question period to right his listing ship in time for the fall campaign. The Green party by comparison has entered the election year buoyed by a string of modest but nevertheless significant provincial breakthroughs. The party tripled its seat count from one to three in New Brunswick, a result that comes with some leverage in a provincial legislative assembly dominated by the opposition. Polls show the Greens in contention for government in Prince Edward Island. The argument is sound. Canada can no longer afford the maladministration of Tories and Liberals, not if the country is to have a future. Even the IPCC with its perpetual optimism, warns we have until 2030 to slash man made greenhouse gas emissions by half if human civilization is to avert catastrophic climate change. That is nowhere on the Liberals' or the Tories' or the New Dems' policy radar. This is the year we need seismic political change. We cannot afford to lose another four years to Trudeau or Scheer. They have to be brought to heel and a weak Liberal minority would be a good start. Singh appears clueless in interviews. Has nothing to say beyond repeating NDP is for the people. Literally not a thing. Won't answer questions on policy because he has none. He's not banal and inarticulate like Scheer, merely incapable of devising policy and not keen at all in detail. Unwilling to put in any effort. Here is a man who likes being the leader of a national party without encumbering himself with the requirement to do any actual work. The position is the thing for him. Unfortunately, the NDP has no money to provide him with staffers to do that needed work while he merely swans about enjoying his self-presumed glory oblivious to concerns expressed by his party's members. I don't understand Jagmeet. He's intelligent enough but he just doesn't seem to have the aptitude necessary to be a party leader, not that the Tories or the Liberals are that strong in leadership. Since you wrote your post yesterday, Mound, I have been giving very, very serious consideration to what you suggested. The more I think about it, your logic is quite compelling. The important thing, Lorne, is to carry that message to others. As I told Owen, make it your own. Make it better. Add your own thoughts and ideas. But circulate the message, spread the idea because, yes, it is compelling and long overdue. Most important of all, we've got to get this right this year. .. most interesting.. we're big fans of Chantel Hebert.. and was quite impressed by Ms May the other night batting smarty pants Evan Soloman around handily while he tried to bait her.. Saw Mulcair as well. It just bears repeating - Scheer is vapid and pedantic a nasty crude glib automaton & walking talking point - running as a loop - OK banal & inarticulate as well - He was the dreg or droog used by CPC_HQ (aka the Harper Brand) to save them from Bernier. A last gasp out of tune musical chair robo winner. And we've been housing him and his brood for almost 10 years. His net worth somehow is almost 10 million, we feed them, protect them via RCMP! Drive him in a limo with security detail, to and fro from work, pay for nannies, housing coordinators, his booze, pay for his laundry.. cook for him, cover all his utilities, pay him a salary plus all benefits for the entire family plus cover expenses enrich his pension. and he repays us with his Hysteric Hamish Historica video brainfart.. plus rhen lips us off via a 3 stageTwitter thread in his unique vapid, pontificating and smug veneery dreary way... Deary me ! We treat this oily evangelical pond scum like the sun god ! if its Conservative.. witness, Rob Anders ..